Fencing with handicap: guidance for London Fencing Club If you count points when fencing, then using handicap can come very... well, handy. Competitive fencers use handicap to re-create situations where they have to double their efforts fighting for every hit. For others handicap can help to bridge the gap between the novices and the more advanced fencers. Below is a simple system which assumes that fencers become more proficient with years of training. We've used categories of Novice, Intermediate, Advanced and Expert to suggest the amount of handicap which could be used in the fights between them. We take as the basis a fight to 5 hits. This can be multiplied by 2 for a fight to 10 hits and by 3 for a fight to15 hits. Following this system a fight to 5 hits between a Novice and an Expert should start with the score 3 : 0. A fight to 15 hits between an Expert and an Intermediate should start with 0 : 6 (which is 0 : 2 multiplied by 3 because it's 15 hit fight). This system is for general guidance only. 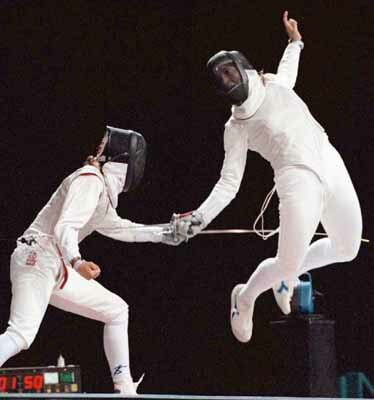 Do not be shy to call yourself a Novice and challenge some of the fencers who've done it for ages. With the handicap you have a good chance to beat them. With thanks to Will Mok for calculations.